It's important to be aware of the gas station environment hazards. We visit gas stations every time we need to refuel our vehicles, but often don't stop to think about the potential hazards involved. To stay safe, it's a good idea to educate yourself and your family about the gas station environment hazards that might impact you. Gasoline is highly flammable, and can be very dangerous if proper safety precautions are not followed. The most prevalent risks associated with gas station environment hazards are fires and explosions. You can view examples of real-life gas station fires, in the Electrostatic Journal. Gas station fires most frequently result from sparks that lead to fuel explosions and static electricity that ignites fuel vapors. Stories about the dangers of cell phones and gas stations have been circulating for years. While some assert that the danger of using cell phones at gas stations is nothing more than an urban legend, there is evidence that cell phone usage near gas pumps does pose explosion risks. Why put yourself or anyone else at risk just to take or make a phone call while pumping gas? Neither cell phones or full-function pagers are designed to be used in any type of ignitable environment. Certainly any area where fuel is being pumped is one where risk of ignition is high. There are situations in which cell phone usage can create sparks capable of igniting a fire or causing an explosion in such an environment. Check the owner's manual that came with your cell phone, and you will likely see a warning against using the device while refueling a vehicle or in any other situation where you are exposed to gasoline or fumes. Whether you are refueling your vehicle or just sitting inside, smoking or lighting cigarettes poses a serious safety risk. A single spark from a cigarette, match or lighter can cause a serious explosion at a gas station. It is not safe to smoke or use matches or lighters while on the grounds of a gas station, even if you aren't actually pumping gas. It is very important to turn off your car's engine while pumping gas. Gasoline vapor that comes into contact with electrical wires while an engine is one can trigger an explosion. You should not get in and out of your automobile while you are pumping gas. Doing so poses a risk of static electricity, which can ignite gasoline vapors. 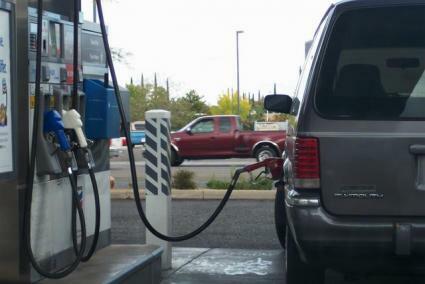 If you absolutely have to enter your vehicle during refueling, it is a good idea to touch the metal on your car (far away from the gas tank) before you take the nozzle out. Even though pumping gas is an everyday occurrence for many people, don't lose sight of the fact that you are responsible for transferring a hazardous substance from one point to another. Don't put yourself or other patrons at needless risk by not paying attention to what you are doing. Don't let your gas tank overflow. Overflowing fuel that gets on you and/or on the ground poses a safety risk. Additionally, gasoline is a skin irritant, and can cause reactions ranging from very mild irritation to serious burns. It is a good idea to get in the habit of waiting a few seconds after you stop pumping gas before removing the nozzle to help prevent drips. Children should never be allowed to pump gasoline. Anyone who is too young to drive a car legally is too young to pump gasoline. Before you start filling a gas can, put it on the ground. Do not attempt to fill it when it is sitting on or is inside your vehicle. There is a greater risk of spilling if the gas can is not on the ground. Additionally, there is a risk of fire resulting from static charges if the gas can is in or on a vehicle while being filled. When you start pumping fuel into the container, make sure that you keep the nozzle in direct contact with the container. Don't fill the container to the very top. You should leave 5 percent to 10 percent of the capacity free, to avoid overflowing fuel and to allow room for the fuel to expand. Do not ever pump gasoline into a container that is not approved for the specific purposes of storing and transporting gasoline. If a fire starts while you are refueling, get out of the area the moment you notice flames. Leave the nozzle in the vehicle and don't try to stop the flow of gasoline. Warn others in the vicinity and get help. Even though gas station environment hazards do pose some risks, observing all posted warnings and exercising common sense regarding safety precautions can help you stay safe. Gas stations can even provide a safe refuge in the event you find yourself in the unfortunate situation of being followed or even chased. Many gas stations are open 24/7, and provide a well-lit and populated environment where you can go to get yourself out of a potentially dangerous situation.